Next How will the new intelligent breed of ROVs benefit us? 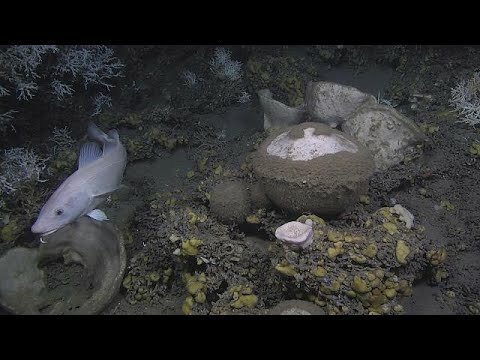 A consortium of scientists from the EU, the US and Canada embarked on a deep-sea sponge research voyage in July to find out what role they might play in recycling the ocean’s waste. For three weeks, G.O.Sars, one of the most advanced research vessels of its kind, took the team of scientists through Norway’s western fjords and up into the Arctic Circle. The oceans cover more then seventy percent of the earth’s surface and sponges have been living in them for over half a billion years. Most sponges are filter feeders, they wait for bacteria or small single-celled organisms to float past them at the bottom of the ocean, and an underwater robot was used to collect sponges from several kilometres down in the Arctic seas. The project’s coordinator described how under-researched the primitive organism is. “We have a pretty good knowledge about sponges in shallow waters and their role there – for example, in coral reef ecosystems. But in deep sea, that’s more or less unexplored. We have an idea of where we find them, their diversity and so on, but their function is more or less unknown,” Hans Tore Rapp, who is a researcher in marine biodiversity at the University of Bergen, said. The work continued day and night: once the underwater robot returned from a dive, the researchers rushed new specimens to their on-board laboratories. Some sponges were kept alive in special aquariums to scrutinize their feeding processes. By filtering sea water through their pores, these primitive animals recycle waste and produce valuable nutrients for other marine organisms. Scientists want to know how much bacteria and other contaminants are filtered out by any given sponge species. One of the goals it to better protect our oceans by trying to protect a fragile organism that performs an important cleaning function. “It actually shows how important sponges are for the entire ocean. Because if you show what they remove from the water, then you can also say, if the sponges themselves are removed, what kind of waste would be accumulating in the ocean because there’s no sponge to clean the ocean anymore?” Martijn Bart, a marine biologist at the University of Amsterdam said. Some of the sponges were dissected and preserved for later study: sponges have already produced valuable chemical compounds that can be used in cosmetics and pharmaceuticals. And they might also help in the fight against cancer. “In many species, it’s already been found that these metabolites have anti-bacterial, anti-fungal, or anti-cancer properties. But about these species here, we don’t know anything yet,” Vasiliki Koutsouveli, a marine biologist from London’s Natural History Museum said. Almost immediately, this expedition discovered several new sponge species. Roughly 8,000 are known to exist, ranging from a few centimetres to more than a metre in size. But scientists estimate twice as many sponge species may exist, unexamined. And the exact role they play in keeping the entire marine ecosystem balanced and healthy is still by and large a mystery that needs to be further explored. “Our project is focused on the North Atlantic. It’s a big ocean, but in the Earth’s big scale it’s quite small, right? So even though we put a lot of effort into this work, we’re just looking at the tip of an iceberg,” Hans Tore Rapp said.